A friend posted this article below via facebook (thank you, Alexis) and I wanted to share it with you...to validate all that you do or to help you understand if you need help understanding. Sometimes I need help understanding even though I am one of those moms that stays home. It's so easy to say "oh, not much" when someone asks you what you did that day. I can't say I "made a presentation to the board" unless I am referring to teaching my kids about Columbus. I can't say I "signed on a new client" unless I mean I had a baby a few months ago. What we do consists of many projects that are never done. Dishes. Laundry. Cleaning. Making meals. Grocery shopping. Changing diapers. Wouldn't it be amazing if we did the dishes and then said, "Great! That's finished." and walked away from the sink forever? When I worked I received all kinds of feedback from co-workers, my supervisor and families. My job was tough, but those words of reassurance stretched me further and helped me continue on. At home, who sees what we do? Pretty much just our spouses. This means that their praise (or lack there of) carries so much more weight. This article does a good job of putting into words those things that we do that are often hard to put into words and that we often don't realize we are doing. They are not concrete tasks that can be finished, they are on-going things that contribute to the rearing of these little people that are at home with us. Click on the image to make it larger and readable. I like it!!! She says it well. 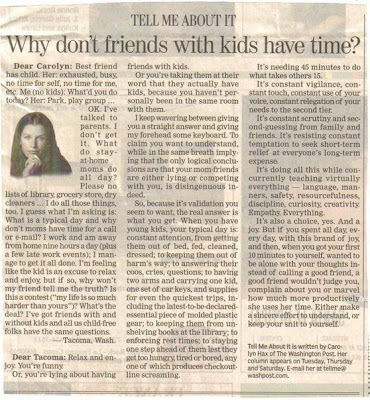 Carolyn Hax rocks at all times.